Borg C, Majolo B, Qarro M & Semple S (2014). A comparison of body size, coat condition and endoparasite diversity of wild Barbary macaques exposed to different levels of tourism. Anthrozoos, 27: 49-63. Molesti S & Majolo B (2014) No short-term contingency between grooming and food tolerance in Barbary macaques (Macaca sylvanus). Ethology, 120: 1-11. Thunström M, Kuchenbuch P & Young C (2014). Concealing of facial expressions by a wild Barbary macaque (Macaca sylvanus). Primates, 55: 369-375. Young C, Majolo B, Heistermann M, Schülke O & Ostner J (2014). Responses to social and environmental stress are attenuated by strong male bonds in wild macaques. Proceedings of the National Academy of Sciences, 201411450. Young C, Majolo B, Schülke O & Ostner J (2014). Male social bonds and rank predict supporter selection in cooperative aggression in wild Barbary macaques. Animal Behaviour, 95: 23-32. Young C, Schülke O & Ostner J (2014). How males form coalitions against group rivals and the Pandit/van Schaik coalition model. Behaviour, 151: 907-934. Majolo B, McFarland R, Young CA, Qarro M (2013). The effect of climatic factors on the activity budgets of Barbary macaques (Macaca sylvanus). International Journal of Primatology, 34: 500-514. McFarland R & Majolo B (2013). The importance of considering the behavioral form of reconciliation in studies of conflict resolution. International Journal of Primatology, 34(1): 15-29. Molesti S & Majolo B (2013) Grooming increases self-directed behaviour in wild Barbary macaques, Macaca sylvanus. Animal Behaviour, 86 (2013) 169-175. Young CA, Majolo B, Heistermann M, Schülke O & Ostner J (2013). Male mating behaviour in relation to female sexual swellings, socio-sexual behaviour and hormonal changes in wild Barbary macaques. Hormones and Behavior, 63: 32–39. McFarland R & Majolo B (2012). The occurrence and benefits of post-conflict bystander affiliation in wild Barbary macaques (Macaca sylvanus). Animal Behaviour, 84: 583-591. Kaburu SSK, MacLarnon A, Majolo B, Qarro M, Semple S (2012). Dominance rank and self-scratching among wild female Barbary macaques (Macaca sylvanus). African Zoology, 47: 74-79. Majolo B. & McFarland R. (2009). Self-suckling in Barbary macaque (Macaca sylvanus) mothers before and after the death of their infant. American Journal of Physical Anthropology, 140: 381-383. Press coverage here. Majolo B, van Lavieren E, Maréchal L, Semple S, Qarro M, Marvin G & MacLarnon A (2012). Out of Asia: The curious case of the Barbary macaque, pp. 167-183. In: The macaque connection: Cooperation and conflict between humans and macaques, Radhakrishna S, Sinha A & Hufmann M (Eds). Springer-Verlag. Molesti S & Majolo B (2012). Testing the anxiety reduction function of grooming interactions in wild Barbary macaques (Macaca sylvanus). ASAB Easter Conference, Aberystwyth, UK. McFarland R & Majolo B (2011). The function of post-conflict bystander affiliation in wild Barbary macaques (Macaca sylvanus). European Federation of Primatology, Almada, Portugal. McFarland R & Majolo B (2011). Repairing relations or reaping rewards? The differential benefits of reconciliation in wild Barbary macaques (Macaca sylvanus). Primate Society of Great Britain Easter Meeting, Liverpool, U.K.
McFarland R & Majolo B (2010). Social Relationships and conflict management in wild Barbary macaques (Macaca sylvanus). Northern England Primate Group, Manchester, U.K.
Kaburu SSK, Semple S, Majolo B, Qarro M & MacLarnon A (2010). Assessment of social stressors among wild female Barbary macaques (Macaca sylvanus) through the measurement of self-scratching and faecal glucocorticoids. XXIII Congress of the International Primatological Society, Kyoto, Japan. Maréchal L, Semple S, Majolo B, Qarro M, & MacLarnon A (2010). Impacts of tourism on anxiety and physiological stress among wild male Barbary macaques in Morocco. Primate Society of Great Britain Winter Meeting, London, U.K.
Kaburu SSK, Semple S, Majolo B, Qarro M & MacLarnon A (2009). Self-scratching and faecal glucocorticoids as non-invasive measures to assess rank-related social anxiety and stress in wild female Barbary macaques (Macaca sylvanus). Primate Society of Great Britain Winter Meeting, London, U.K.
Young C (2013). Cooperation and competition in wild male Barbary macaques (Macaca sylvanus) in Morocco. Unpublished PhD Thesis, University of Gottingen, Germany. McFarland R (2011). The management of social relationships in wild Barbary macaques (Macaca sylvanus). Unpublished PhD Thesis, University of Lincoln, U.K.
Lyon J (2012). 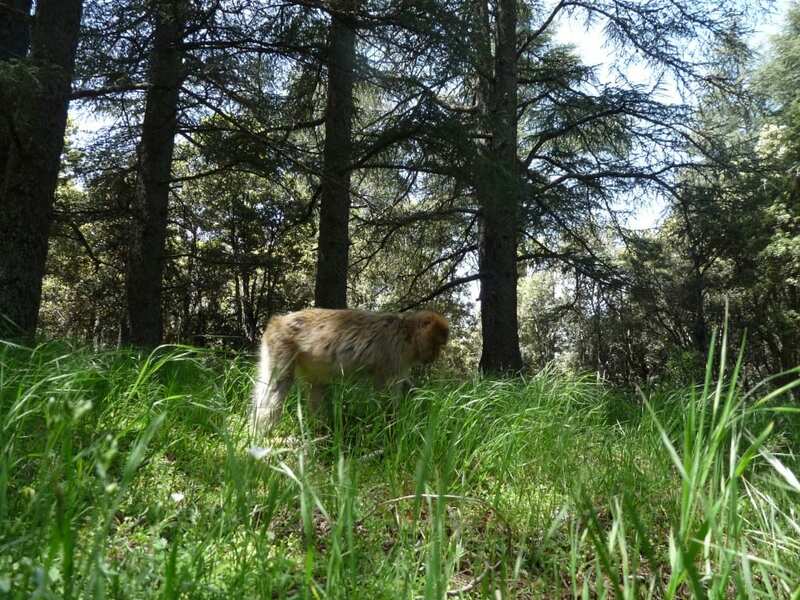 The ‘anatomy of disturbance’ – a study of anthropic disturbance on Barbary macaque (Macaca sylvanus) troops in the Middle Atlas, Morocco. Unpublished MRes Thesis, Imperial College London, U.K.
Seltmann A (2012). Group movements and decision-making in Barbary macaques (Macaca sylvanus) in the Middle Atlas, Morocco. Unpublished MRes Thesis, University of Göttingen, Germany. Borg C (2011). A comparison of endoparasites and body condition in three groups of Barbary macaques (Macaca sylvanus) exposed to different levels of tourism in Morocco. Unpublished MRes Thesis, Roehampton University, U.K.
Maréchal L (2010). Tourism effects on behaviour, anxiety and physiological stress levels of wild male Barbary macaques (Macaca sylvanus) in Morocco. Unpublished MRes Thesis, Roehampton University, U.K.
Mahfouz EM (2009). Stress, aggression and affiliation among adult male Barbary macaques (Macaca sylvanus). Unpublished MRes Thesis, Roehampton University, U.K.
Kaburu SSK (2009). A study of female feeding competition in Barbary macaques (Macaca sylvanus) in the Middle Atlas (Morocco). Unpublished MRes Thesis, Roehampton University, U.K.